The Benq LT 100 is mainly targeted at female consumers. It comes with 14-megapixel sensor, a 26mm wide-angle lens with 5x optical zoom, has a 3-inch LCD touchscreen on the back that allows you to focus and capture images by simply tapping on the object or by circling on a specific part of the image to get a swift automatic zoom. The LT 100 comes in red metal casing, offers a high sensitivity of up to ISO6400, Speedy Burst function that captures 30 frames per sec. 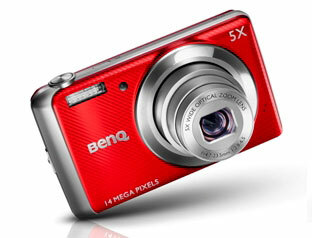 at 640×480 resolution, with automatic focus and a wide range of image enhancement features and modes. BenQ’s new camera LT 100 will be available worldwide this month. Tags:Benq LT 100 digital camera, Benq LT 100 digital camera features, Benq LT 100 digital camera specifications, Benq LT 100 digital camera review, Benq LT 100 digital camera details, Benq LT 100 digital camera availability, Benq LT 100 digital camera specs, Benq LT 100 digital camera images, Benq LT 100 digital camera pics, Benq LT 100 digital camera pictures, Benq LT 100 digital camera pics, Benq LT 100 digital camera price, Benq LT 100 digital cam, Benq LT 100 cam, Benq digital camera, LT 100 digital camera,LT 100 camera, Benq camera.